Morels are edible wild mushrooms that are related to the truffle and prized by chefs and foodies alike. The earthy, nutty, and smokey flavor and unique honeycomb texture and shape make these wild mushrooms the star of any dish, especially since they need very little embellishment when cooked. Unfortunately, morels have a short season, often just a few weeks in some areas—and some years there isn't even a harvest. This is even more reason to preserve these favored fungi by drying them, so you can enjoy at any time. Luckily, it's easy to dry morels at home and can be stored in air-tight containers at room temperature for up to 6 months. (For longer storage keep them in the freezer.) 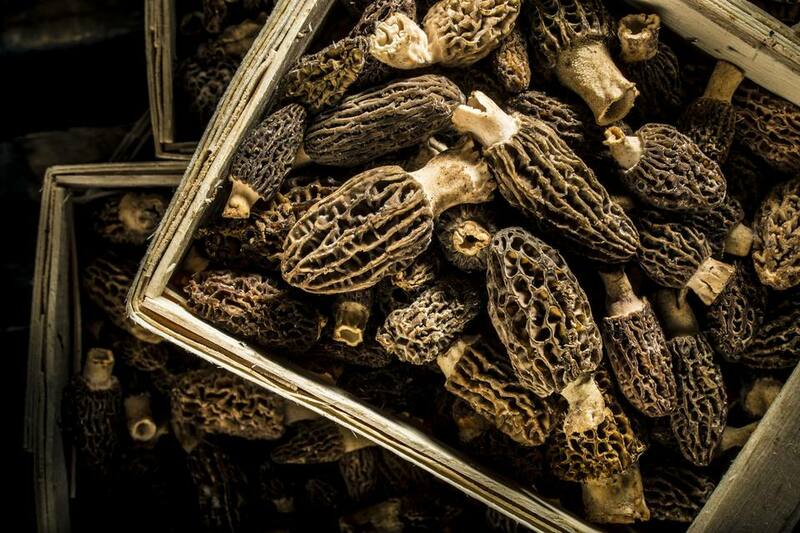 Once dried, you simply re-hydrate them to use in recipes like sautéed morels or morel risotto. Before you dry them, however, you need to clean them, and morels require a bit more cleaning than most mushrooms. A simple swipe with a damp towel won't get the grit out of the sponge-like sides of morel mushrooms. Start with a soak in cold water, swish the morels around, and then lift the morels out of the water, leaving any grit behind. Drain well and pat morels dry with paper towels or clean kitchen towels. Now you are ready to dry your morels, which can be done one of three ways. For this method, you don't need any equipment, save for some sewing supplies. The morels are strung together and then hung to air dry. You will need a large darning needle or yarn needle, and cotton quilting thread, coat button thread, or old-fashioned unwaxed and unflavored dental floss. Thread the needle and string cleaned morels lengthwise, knotting the thread/floss at each end of each morel mushroom to keep them in place; leave at least 1/2 inch between each morel so plenty of air can circulate around each mushroom. Hang the strings of morels in a cool, dry place until they are completely dry and brittle, at least 2 days and up to a week. If you don't mind keeping your oven on a very low setting for several hours, the oven-dry method is an easy technique for drying the morels. Set cooling racks on baking sheets and arrange the cleaned morels on the cooling racks. Or, remove the racks from the oven and use quilting thread, coat button thread, or un-waxed dental floss to tie morels by the stem to the oven racks so the morels are hanging down from the racks. Set the racks back in the oven. Whether laying the morels on cooling racks or hanging them from the oven racks, you need to heat the oven to 130 F to 140 F and let morels sit until they are completely dry and brittle, about 8 hours. If you happen to own a food dehydrator, you will be glad to know that morels dry nicely in this piece of equipment. Once the morels are cleaned and dried off, lay them in a single layer on the racks. Set the dehydrator to 110 F and dry for about 10 hours. Dried morels are easy to rehydrate. Simply put the amount you want to use in a bowl and cover with water. Let sit until the morels are soft and pliable, about 20 minutes. Reserve the soaking liquid to use in the dish you're cooking, or use as a jump-start to making vegetarian broth if you like. For risotto and pasta sauces, you may want to soak the morels in boiling water; this will bring out more of the earthy flavor into the liquid, which you can then use in the risotto or sauce.